It has been months since AMD's Bulldozer architecture surprised the hardware enthusiast community with performance all over the place. The opinions vary wildly from “server benchmarks are here, and they're a catastrophe” to “Best Server Processor of 2011”. The least you can say is that the idiosyncrasies of AMD's latest CPU architecture have stirred up a lot of dust. Now that the dust has settled, the Bulldozer chips now account for more than half of Opteron shipments and revenues. Since AMD's Financial Analyst Day (February 2, 2012), we have new code names: the improved Bulldozer architecture "Piledriver" will power the "Abu Dhabi" chip, a replacement for the current top server chip "Interlagos". 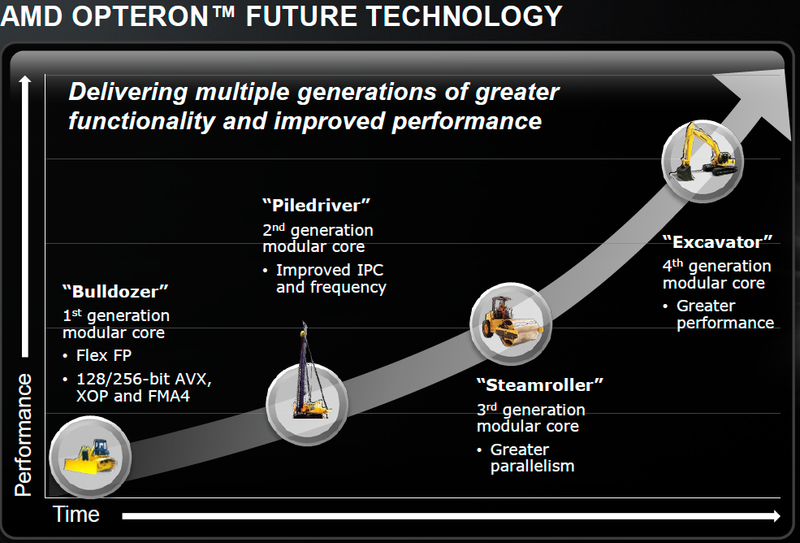 AMD is clearly committed to the new "Bulldozer" direction: fitting as many cores as possible into a certain power envelope to improve thread throughput, while trying to "hold the line" on single-threaded performance. In theory, the new 16-core Interlagos should have offered somewhere around a 33% boost in most highly-threaded applications. The reality is unfortunately not that rosy: in many highly-threaded server applications such as OLAP databases and virtualization, the new Opteron 6200 fails to impress and is only a few percent faster than it's older brother the 12-core Magny-Cours. There are even times where the older Opteron is faster. Some, including sources inside AMD, have blamed Global Foundries for not delivering higher clocked SKUs. Sure, the clock speed targets for Interlagos were probably closer to 3GHz instead of 2.3GHz. But that does not explain why the extra integer cores do not deliver. We were promised up to 50% higher performance thanks to the 33% extra cores, but we got 20% at the most. The combination of low single-threaded performance, the failure to really outperform the previous generation in highly-threaded applications, the relatively high power consumption at full load, and the fact that the CPU is designed for high clock speeds gives a lot of people a certain sense of Déjà vu: is this AMD's version of the Pentum 4 ?
" Unfortunately, the thought still in the back of my mind while reading was why did AMD reinvent the Pentium 4? I just don't get it." "A core this complex in my opinion has not been optimized to its fullest potential. Expect better performance when AMD introduces later steppings of this core with regard to power consumption and higher clock frequencies." Although there have already been quite a few attempts to understand what Bulldozer is all about, we cannot help but not feel that many questions are still unanswered. Since this architecture is the foundation of AMD's server, workstation, and notebook future (Trinity is based on the improved Bulldozer core with the codename "Piledriver"), it is interesting enough to dig a little deeper. Did AMD take a wrong turn with this architecture? And if not, can the first implementation "Bulldozer" be fixed relatively easily? We decided to delve deeper into the SAP and SPEC CPU2006 results, as well as profiling our own benchmarks. Using the profiling data and correlating it with what we know about AMD's Bulldozer and Intel's Sandy Bridge, we attempt to solve the puzzle.